[Updated with maps] Following at least three incidents involving drones over Westgate Correctional Facility, officials have issued new directions for the flying of drones, with restricted fly zones over Westgate, Police Headquarters at Prospect, and an update to the no-fly zone at the airport. 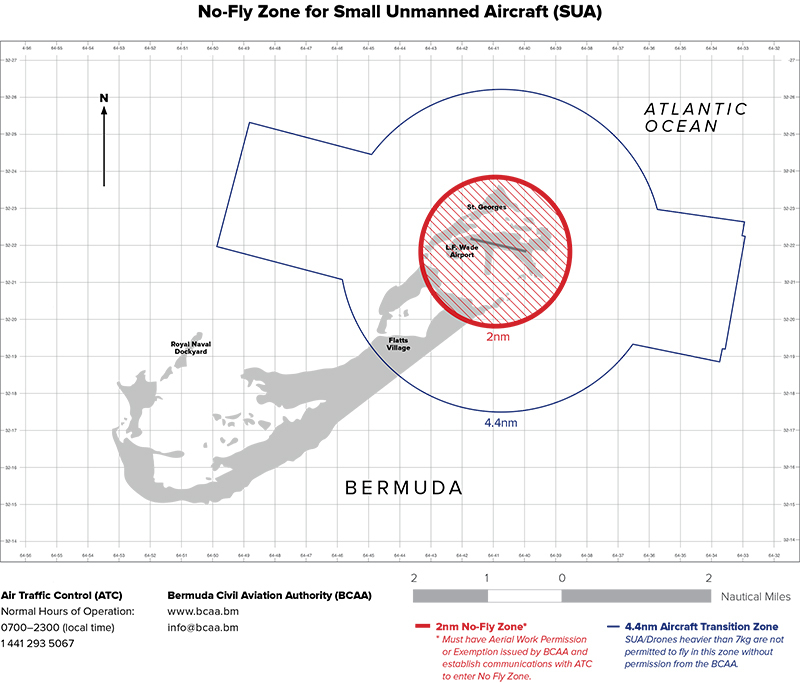 The BCAA said, “As of March 15th 2019, the Bermuda Civil Aviation Authority [BCAA] have issued new Directions in accordance with the Air Navigation [Overseas Territories] Order under Article 68 to include restricted fly zones over Westgate Correctional Facility, Police Headquarters at Prospect, and an update to the no-fly zone at L.F Wade International Airport. 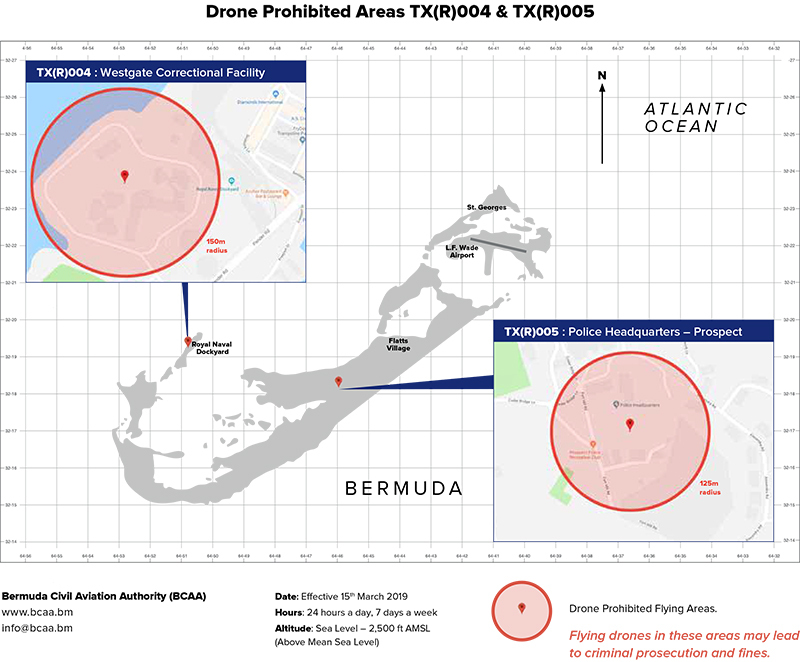 Thomas Dunstan, Director General of BCAA commented, “Drones have become more popular in Bermuda as technological advances have made them more accessible and affordable to the general public. 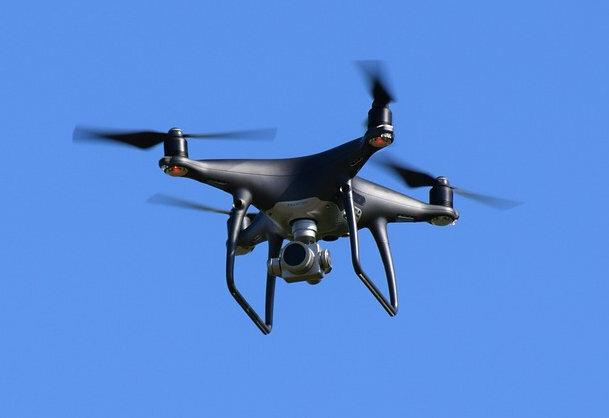 The increase in drone activity has led to safety and security challenges in the local airspace, specifically around the airport, Westgate and the Police headquarters. The BCAA added, “The Directions follow at least three incidents involving drones over the Westgate Correctional Facility and one unauthorized drone flying over the airport property. All Drones and operators should have to Licensed. And what would that do to help? Ever heard of removing serial numbers from drones? Dumb! A $4,000 fine is nothing if drone used to drop drugs to inmates or to spy on politicians! That’s right we are watching you OBA! You might consider shooting them down? Maybe you don’t realize it, but they’re not the government. We must also consider the fact that Westgate is a drug free zone during sentencing. Have seen many drones at Loren and Mid Ocean Club sites so wonder if the elite are under surveillance? Or maybe data is being collected to use against them like who is talking to who or airiing any dirty laundry?